We're answering common questions about what to do if a tornado strikes. 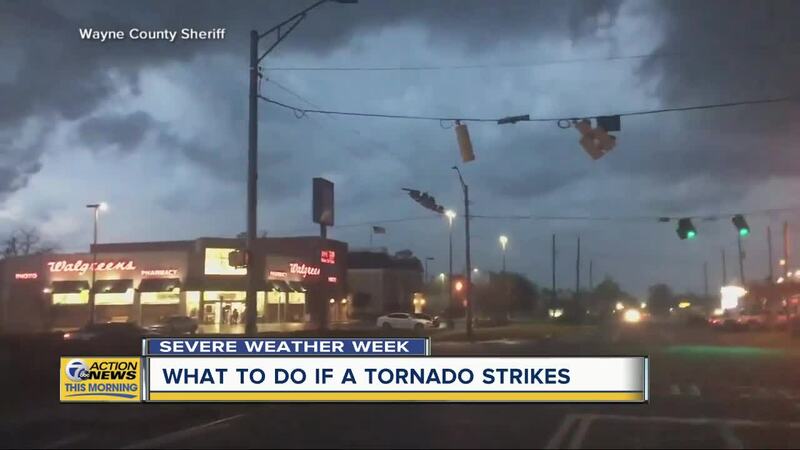 (WXYZ) — Spring is less than a week old, but wild weather has already spawned two tornadoes, and more severe weather is bound to sweep through metro Detroit. For Severe Weather Awareness Week, we're answering common questions about what to do if a tornado strikes, as you may not always be home. If you're driving, the best thing to do is pull over and get out of the car if you can, and find a sturdy building. That's your safest bet. If not, find the lowest spot you can, hopefully lower than the road like a ditch. Then, get down and cover your head. For this situation, it's best to get to the lowest floor possible and as far away from windows as you can. If you can, cover yourself with thick padding in case the ceiling or roof gives way. Tornadoes can strike at any time, any where. That means you may be at a baseball game, at the park, or just out in the open. If that happens, seek shelter where you can. A sturdy building is your first choice, and if nothing is around, lie face down on low ground, protecting your head with your arms. Also, get as far away from trees and cars, as they can become projectiles in tornadoes. If you're out at the mall or in a movie theatre, there may not be a basement. Find small, interior rooms and stay away from windows. Also, remember that the windows may be above you. Many malls use glass to allow natural light in.